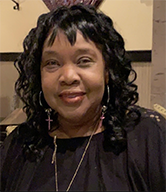 Zella “Zel” Fields, 58, passed away on March 21, 2019. Visitation will be held Friday, March 29, 2019 from 4 p.m. to 7 p.m. at Dixon Funeral Home in Brazoria, Texas. Funeral services will be held Saturday, March. 30, 2019 at 11 a.m. at Greater Mount Zion Church in Brazoria. Burial will be at St. Paul Cemetery, in Brazoria.